…og velkommen tilbake. Simon Johnson får første bloggpost på en mandag. Solen har kommet til studentene, så studentene gjør som bare studentene gjør. Prokrastinerer i solen. Men, prokrastinering med Instapaper installert er en annen sak og øverst på listen av lagrede artikkler er Simon Johnson, tidligere sjefsøkonom i IMF, og hans post i NY Times. Now we find ourselves again about to debate the fundamental Hamiltonian questions: At the federal level, who will pay how much, to whom and for what, exactly? «In the nation’s latest fiscal mood swing, the mainstream consensus has swung from ‘we must extend the Bush tax cuts’ (in November and December 2010) toward ‘we must immediately cut the budget deficit.’ The prevailing assumption, increasingly heard from both left and right, is that we already have far too much government debt — and any further significant increase is likely to ruin us all. This way of framing the debate is misleading — and at odds with the fiscal history of the United States. It masks the deeper and important issues here, which are more about distribution, in particular how much relatively wealthy Americans are willing to transfer to relatively poor Americans. To think about the current size of our debt, start at the beginning of the American republic. (For a very short history of United States government debt, listen to my conversation last weekend with Guy Raz of National Public Radio; we cover more than 200 years in about three minutes. For more detail, look up the annual debt numbers at Treasury Direct). On the first day of 1791, the recently founded United States Treasury had nearly $75.5 million in outstanding debt. This was roughly around 40 percent of gross domestic product, a large amount of debt relative to the size of the economy — but not out of proportion to what we have become accustomed to in recent decades. However, relative to federal revenues, the debt was enormous — about 20 times the amount that the government was then capable of taking in. In contrast, the total Treasury debt outstanding since 1950 has fluctuated between 30 and 90 percent of G.D.P., with the debt-revenue ratio never worse than 5 to 1 — and in recent decades between 2 to 1 and 3 to 1. The debt-revenue ratio matters, as it is relevant to whether the country can readily service the debt. Very few countries default because they can’t afford to pay their debts, either to their own citizens or to foreigners. Defaults occur when the political process in a country determines that, for whatever reason, the government cannot raise sufficient revenue. At the beginning of the American republic, this was the central fiscal fight – primarily whether Alexander Hamilton would succeed in imposing a tariff on imports as a way for the federal government to raise revenue and thus, among other things, create a way to ‘fund’ the debt (meaning cover the interest and, over time, pay down the principal). The tariff revenue fight was nasty and drawn out, pitting North against South in a way that would generate resentment and friction throughout the 19th century. After losing repeated votes in the House of Representatives, Hamilton eventually prevailed – part of a larger deal with Thomas Jefferson and James Madison that was very much about who would pay what amount to create and sustain the new federal government. That debate was also focused on the kind of federal role the political elite wanted to achieve. Once this political deal was done, United States government obligations moved quickly from widely reviled status to being perceived as relatively safe. Fiscal mood swings go both ways. The main difference between the debate then and now is with regard to spending. In the early 1790s — and again after the Civil War, World War I and World War II — the spending surge had already taken place and the issue was how to move the government into surplus and bring down the debt. Previous fiscal debates in the United States have therefore very much been about the distribution of the tax burden within a pro-growth system, and this again needs to be atop our political agenda – that was one reason I opposed extending the Bush-era tax cuts. In addition to this traditional issue, we are now confronting more directly than ever the question of redistribution that takes place through government spending. In ‘Growing Public: Social Spending and Economic Growth Since the 18th Century’ (Cambridge University Press, 2004), Peter Lindert traced changes in attitudes and actions toward redistribution in the United States and other countries. The pendulum of opinion has swung many times, and the United States has followed a somewhat different path than other relatively rich countries. Most of our government spending, now as always, goes to wars and transfers to relatively poor people and to older people. The military spending will come down — if we can end the wars (as we did in the past). The social transfers were constructed in a more open-ended fashion — and our long-term budget forecasts account for this form of future spending in a more transparent and more honest way than we do for the probability of future wars or financial crises. The real budget debate is not about a few billion here or there – for example, in the context of when the government’s debt ceiling will be raised. And it is not particularly about the last decade’s jump in government debt level. Although this has grabbed the headlines, it is something that we can grow out of (unless the political elite decides to keep cutting taxes). The real issue is how much relatively rich people are willing to pay, and on what basis, in the form of transfers to relatively poor people — and how rising health-care costs should affect those transfers. The consensus for Hamilton, Jefferson, Madison and their contemporaries was simple: No significant social spending was administered by the federal government. Professor Lindert estimates that social spending (including on ‘poor relief’ and public education) in the United States even by 1850 was less than five-tenths of 1 percent of G.D.P. Ja, han ser litt ut som ‘Wilson’ i tv-serien ‘House’, men ikke la det stoppe deg fra å bruke 10 minutter på denne videoen. Som han selv sier: ‘gloves must come off’. Simon Johnson (MIT) under høring: – Et sunt finansmarked kan ikke bygges på forventninger om nødhjelp. Under høringen ‘Hearing on the TARP’s Impact on Financial Stability,’ i Kongresssen gir professor Simon Johnson sine synspunkter på finanskrisen og regjerningens (og sentralbankens) håndtering av den. Dette er en fin oppsummering av hva akademia mener om finans- og pengepolitikken som ble ført. Og artikkelen er i punkter, så du får mye informasjon konsentrert. 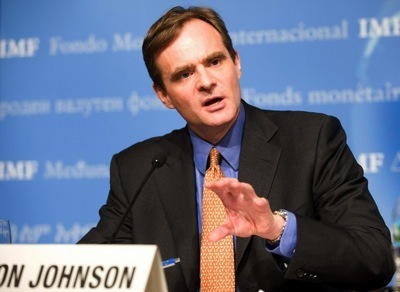 Simon Johnson: «A Healthy Financial System Cannot Be Built on the Expectation of Bailouts»: «Testimony submitted to the Congressional Oversight Panel, ‘Hearing on the TARP’s Impact on Financial Stability,’ Friday, March 4, 2011. 1) The financial crisis is not over, in the sense that its impact persists and even continues to spread. Employment remains more than 5 percent below its pre-crisis peak, millions of homeowners are still underwater on their mortgages, and the negative fiscal consequences – at national, state, and local level – remain profound. 2) To the extent that a full evaluation is possible today, the financial crisis produced a pattern of rapid economic decline and slow employment recovery quite unlike any post-war recession – it looks much more like a mini-depression of the kind the US economy used to experience in the 19th century. In addition, the fiscal costs of the disaster in our banking system so far amount to roughly a 40 percentage point increase in net federal government debt held by the private sector, i.e., roughly a doubling of outstanding debt. 3) In this context, TARP played a significant role preventing the mini-depression from becoming a full-blown Great Depression, primarily by providing capital to financial institutions that were close to insolvency or otherwise under market pressure. 5) Adjustments to our regulatory framework, including the Dodd-Frank financial reform legislation, have not fixed the core problems that brought us to bring of complete catastrophe in fall 2008. Powerful people at the heart of our financial system still have the incentive and ability to take on large amounts of reckless risk – through borrowing large amounts relative to their equity. When things go well, a few CEOs and a small number of others get huge upside. 6) When things go badly, society, ordinary citizens, and taxpayers get the downside. This is a classic recipe for financial instability. 7) Our six largest bank holding companies currently have assets valued at just over 63 percent of GDP (end of Q4, 2010). This is up from around 55% of GDP before the crisis (e.g., 2006) and no more than 17% of GDP in 1995. 8) With assets ranging from around $800 billion to nearly $2.5 trillion, these bank holding companies are perceived by the market as ‘too big to fail,’ meaning that they are implicitly backed by the full faith and credit of the US government. They can borrow more cheaply than their competitors and hence become larger. 9) In public statements, top executives in these very large banks discuss their plans for further global expansion – presumably increasing their assets further while continuing to be highly leveraged. 10) There is nothing in the Basel III accord on capital requirements that should be considered encouraging. Independent analysts have established beyond a reasonable doubt that substantially raising capital requirements would not be costly from a social point of view (e.g., see the work of Anat Admati of Stanford University and her colleagues). 11) But the financial sector’s view has prevailed – they argue that raising capital requirements will slow economic growth. This argument is supported by some misleading so-called ‘research’ provided by the Institute for International Finance (a lobby group). The publicly-available analytical work of the official sector on this issue (from the Bank for International Settlements and the New York Fed) is very weak – if this is the basis for policymaking decisions, there is serious trouble ahead. 12) Even more disappointing is the failure of the official sector to engage with its expert critics on the issue of capital requirements. This certainly conveys the impression that the regulatory capture of the past 30 years (as documented, for example, in 13 Bankers) continues today – and may even have become more entrenched. 13) There is an insularity and arrogance to policymakers around capital requirements that is distinctly reminiscent of the Treasury-Fed-Wall Street consensus regarding derivatives in the late 1990s – i.e., officials are so convinced by the arguments of big banks that they dismiss out of hand any attempt to even open a serious debate. 14) Next time, when our largest banks get into trouble, they may be beyond ‘too big to fail’. As seen recently in Ireland, banks that are very big relative to an economy can become ‘too big to save’ – meaning that while senior creditors may still receive full protection (so far in the Irish case), the fiscal costs overwhelm the government and push it to the brink of default. 15) The fiscal damage to the United States in that scenario would be immense, including through the effect of much higher long term real interest rates. It remains to be seen if the dollar could continue to be the world’s major reserve currency under such circumstances. The loss to our prestige, national security, and ability to influence the world in any positive way would presumably be commensurate. 16) In 2007-08, our largest banks – with the structures they had lobbied for and built – brought us to the verge of disaster. TARP and other government actions helped avert the worst possible outcome, but only by providing unlimited and unconditional implicit guarantees to the core of our financial system. This can only lead to further instability in what the Bank of England refers to as a ‘doom loop’. To lay the groundwork for a sustainable recovery. 2) IMF programs are routinely designed with these criteria in mind and are evaluated on the basis of: the depth of the recession and speed of the recovery, relative to the initial shock; the side-effects of the macroeconomic policy response, including inflation; and whether the underlying problems that created the vulnerability to panic are addressed over a 12-24 month horizon. 3) This same analytical framework can be applied to the United States since the inception of the Troubled Asset Relief Program (TARP). While there were unique features to the US experience (as is the case in all countries), the broad pattern of financial and economic collapse, followed by a struggle to recover, is quite familiar. 4) The overall US policy response did well in terms of preventing spending from collapsing. Monetary policy responded quickly and appropriately. After some initial and unfortunate hesitation on the fiscal front, the stimulus of 2009 helped to keep domestic spending relatively buoyant, despite the contraction in credit and large increase in unemployment. It was also consistent with parallel countercyclical fiscal moves in other countries. This was in the face of a massive global financial shock – arguably the largest the world has ever seen – and the consequences, in terms of persistently high unemployment, remain severe. But it could have been much worse. 5) There is no question that passing the TARP was the right thing to do. In some countries, the government has the authority to provide fiscal resources directly to the banking system on a huge scale, but in the United States this requires congressional approval. In other countries, foreign loans can be used to bridge any shortfall in domestic financing for the banking system, but the U.S. is too large to ever contemplate borrowing from the IMF or anyone else. Preventing banks from collapsing in an uncontrolled manner. This often involves at least temporary blanket guarantees for bank liabilities, backed by credible fiscal resources. The government’s balance sheet stands behind the financial system. In the canonical emerging market crises of the 1990s – Korea, Indonesia, and Thailand – where the panic was centered on the private sector and its financing arrangements, this commitment of government resources was necessary (but not sufficient) to stop the panic and begin a recovery. Taking over and implementing orderly resolution for banks that are insolvent. In major system crises, this typically involves government interventions that include revoking banking licenses, firing top management, bringing in new teams to handle orderly unwinding, and – importantly – downsizing banks and other failing corporate entities that have become too big to manage. In Korea, nearly half of the top 30 pre-crisis chaebol were broken up through various versions of an insolvency process (including Daewoo, one of the biggest groups). In Indonesia, leading banks were stripped from the industrial groups that owned them and substantially restructured. In Thailand, not only were more than 50 secondary banks (‘Finance Houses’) closed, but around 1/3 of the leading banks were also put through a tough clean-up and downsizing process managed by the government. Addressing immediately underlying weaknesses in corporate governance that created potential vulnerability to crisis. In Korea, the central issue was the governance of nonfinancial chaebol and their relationship to the state-owned banks; in Indonesia, it was the functioning of family-owned groups, which owned banks directly; and in Thailand it was the close connections between firms, banks, and politicians. Of the three, Korea made the most progress and was rewarded with the fastest economic recovery. 7) If any country pursues (a) unlimited government financial support, while not implementing (b) orderly resolution for troubled large institutions, and refusing to take on (c) serious governance reform, it would be castigated by the United States and come under pressure from the IMF. Providing unlimited implicit guarantees does not help underpin financial stability. 8) At the heart of any banking crisis is a political problem – powerful people, and the firms they control, have gotten out of hand. Unless this is dealt with as part of the stabilization program, all the government has done is provide an unconditional bailout. That may be consistent with a short-term recovery, but it creates major problems for the sustainability of the recovery and for the medium-term. Serious countries do not do this. 9) As Larry Summers put it, in his 2000 Ely Lecture to the American Economic Association, ‘[I]t is certain that a healthy financial system cannot be built on the expectation of bailouts’ (American Economic Review, vol. 90, no. 2, p.13). 10) Seen in this context, TARP was badly mismanaged. In its initial implementation, the signals were mixed – particularly as the Bush administration sought to provide support to essentially insolvent banks without taking them over. Standard FDIC-type procedures, which are best practice internationally, were applied to small- and medium-banks, but studiously avoided for large banks. As a result, there was a great deal of confusion in financial markets about what exactly was the Bush/Paulson policy that lay behind various ad hoc deals. 11) The Obama administration, after some initial hesitation, used ‘stress tests’ to signal unconditional support for the largest financial institutions. By determining officially that these firms did not lack capital – on a forward looking basis – the administration effectively communicated that it was pursuing a strategy of ‘regulatory forbearance’ (much as the US did after the Latin American debt crisis of 1982). The existence of TARP, in that context, made the approach credible – but the availability of unconditional loans from the Federal Reserve remains the bedrock of the strategy. 12) The downside scenario in the stress tests was overly optimistic, with regard to credit losses in real estate (residential and commercial), credit cards, auto loans, and in terms of the assumed time path for unemployment. As a result, our largest banks remain undercapitalized, given the likely trajectory of the US and global economy. This is a serious impediment to a sustained rebound in the real economy – already reflected in continued tight credit for small- and medium-sized business. 14) Exacerbating this issue, TARP funds supported not only troubled banks, but also the executives who ran those institutions into the ground. The banking system had to be saved, but specific banks could have wound down and leading bankers could and should have lost their jobs. Keeping these people and their management systems in place serious trouble for the future. 15) The implementation of TARP exacerbated the perception (and the reality) that some financial institutions are ‘Too Big to Fail.’ This lowers their funding costs, probably by around 50 basis points (0.5 percentage points), enabling them to borrow more and to take more risk with higher leverage. 16) The Obama administration argues that regulatory reforms, including the Dodd-Frank Act and associated new rules, will rein in the financial sector and make it safer. Unfortunately, this assessment is not widely shared. 18) Regulation remains weak and many regulators are still captured by the ideology that big banks are good for the rest of the economy. Capital requirements will increase but are likely to remain below the level that Lehman had in the days before it failed (11.6 percent tier one capital). There will be no effective cap on the size of our biggest banks. They have an incentive to take on a great deal of leverage. This confers private benefits but great social costs – lowering economic growth, increasingly volatility, and making severe crises more likely.